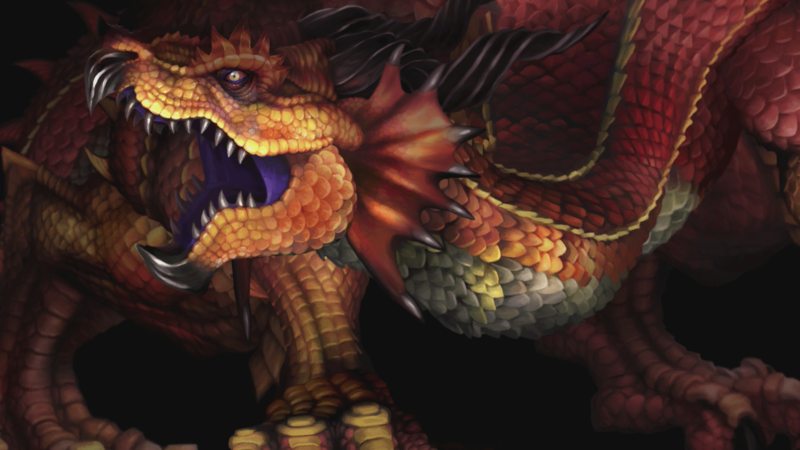 The dragon; a classic fantasy trope. Medieval fantasy – whether it be light or dark – has always fascinated me the most among the many fantasy sub-genres out there. A rag-tag group of adventurers going on the journey of a lifetime, littered with loot, horrid and majestic beasts, and with a goal to vanquish all evil – leading to the restoration of peace throughout the land. The sheer sense of discovery – treading where no man has ever stepped foot, standing up to the ever impending doom and destroying said doom with hand-forged weaponry, magic, and archery. It’s ingenious and incredibly enthralling fiction that caused an itch within me that I scratched a lot during my youth. Through imagination with friends and family, or by reading/watching the many books and movies out there; I couldn’t stop my consumption of medieval fantasy goodness. However, when “adulthood” kicked in, my previous interests and activities either got buried or forgotten, like a locked chest filled with nostalgia and memories residing in the depths of my mind. It had been awhile since that sense of youthful adventure had resurfaced within me. That is, until Vanillaware and Atlus’ Dragon’s Crown came out. It was just the key. Each line of text is majestically narrated. 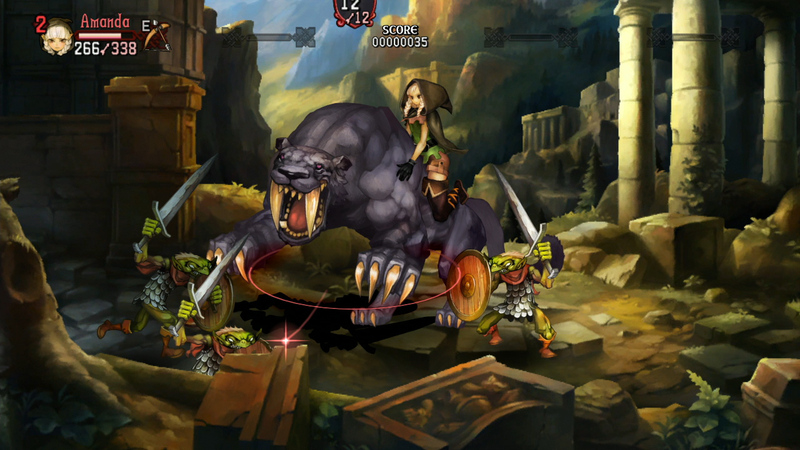 In Dragon’s Crown, players are thrown into the medieval fantasy world of Hydeland in the role of 6 possible heroes. The Fighter, Amazon, and Dwarf are your heavy damage dealers, while the Elf, Wizard, and Sorceress are deadly at a range, but can hold their own up close. All of these heroes can be lightly customized. Players get to choose their name, a choice between 5 different color options, and personalized multiplayer messages (I’ll touch upon this later). Anyway, these initiate adventurers all set-off from their homeland in search of unforgettable adventure, insurmountable power, and bountiful treasure. You’ll start off by going through an incredibly informative tutorial that will teach you the basics of the character you’re playing. This portion gives some insight to your character’s travels up until your arrival at the inn/tavern in Hydeland. It’s also the point where you meet your permanent companion Rannie. Rannie is a rogue with a knack for unlocking doors and chests found throughout your travels. Sounds like a swell guy, right? Well, if any gold or loot has been left on the ground, Rannie will dart toward it, and pick it up for his own profit (he is a rogue after all). But after your arrival at the inn/tavern, you rest up and hit the streets in search of the adventure you ever so craved. You stop by the Adventures Guild first and are bestowed with an introductory quest to prove your mettle – after being ridiculed for the shanty shape your equipment is in, of course. This opening narrative is a nice throwback to classic medieval fantasy of the past, and a wonderful way to get you in the mood for the adventure to come. And boy, is it a grand one. To make the experience even better, your whole journey is expertly narrated as if it was a bedtime story. The visuals are even bright and colorful like a story book. Is the story simple? Yes. Does it follow the usual fantasy tropes found in many other pieces of fiction? Yes. 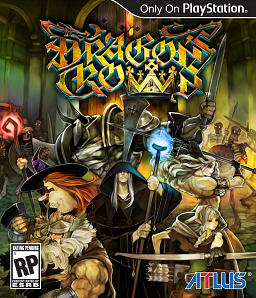 Does Dragon’s Crown benefit from it? Very much so! The simple story implemented in the game – used mainly as an explanation for your actions and travels – was a wise decision by the developers. As a kid, the majority of my most memorable tales featured plane-Jane backdrops. Rid the land of evil, grab the gold, save the day, the end. And I highly believe that the theme of childhood-esque adventure took center stage during the development of Dragon’s Crown. Why, you may ask? Current games rarely bring up those youthful feelings and nostalgia like this game did with me. There were points in my play-through where I became oblivious to my surroundings and completely engrossed in the experience, having to, literally, break myself away. Just the fact that Dragon’s Crown is capable of resurfacing those forgotten feelings of old within me with it’s gameplay, soundtrack, visual presentation, and “rags-to-riches” story are proof enough. Well, we lost our dwarf… AGAIN! So to start things off: gameplay. 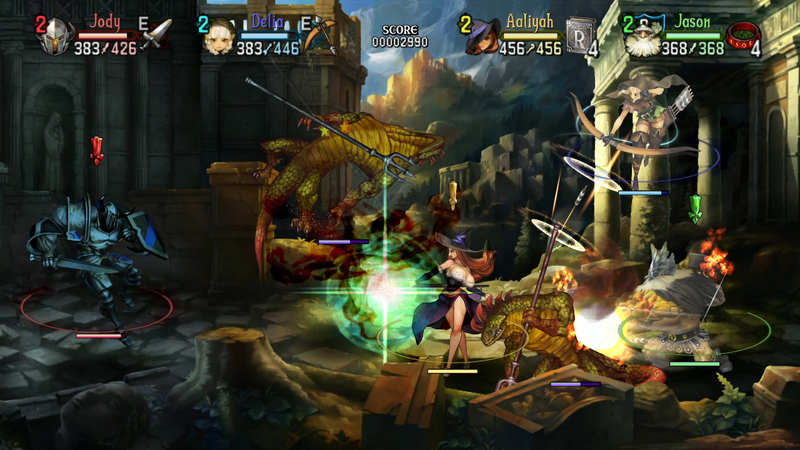 Dragon’s Crown controls beautifully and has a perfect blend of old and new gameplay mechanics. 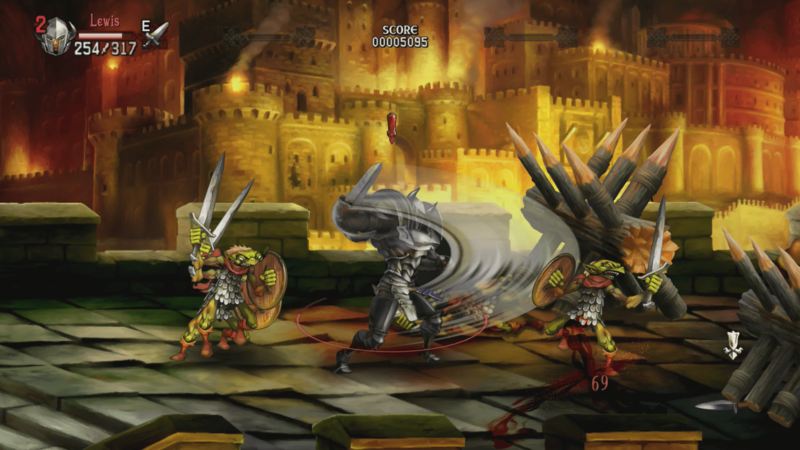 Imagine Golden Axe with a modern day RPG twist. You control your character with either the d-pad or left-analog stick, and can move them up, down, left, or right – you can change to your favored control scheme in the options – and dodge attacks by pressing R1. All main attacks come from tapping square (hold down for a charged melee attack), and each character’s special ability is controlled using circle. While the button combination, and down+square slide kick, stays the same for each character, their fighting style, special ability, and weight differ. The Elf, though archery is her specialty, can put up a fight with her swift kick combos. The Fighter, Amazon, and Dwarf all have a similar focus on close quarters combat with melee weapons. The special ability for the three “damage dealers” is a powerful charged melee attack that deems their weapons unusable on the ground for short time. Thankfully, each one is well versed in hand-to-hand, so you can still put up a fight while waiting for your weapon to become usable. Then, there are the intricate and varied attacks of the Sorceress and Wizard. While both have anti-air magic attacks, the Sorceress follows more of a support role, while the Wizard is an offensive-magic beast. Regardless, each of their special magic attacks are all controlled by a combination of the d-pad/right-analog stick and the circle button. For instance, up+circle will cause a magical upward attack, sending foes to the sky and leaving them open for punishing juggle attacks. Although these attacks use up your MP, holding up+square will allow the Wizard and Sorceress to replenish their MP an infinite amount of times. And yes, the tutorial mentioned earlier covers every bit of this. One thing it does not cover however, is mountable beasts. While riding mounts, players can jump, run, and unleash deadly melee attacks or even spit fireballs. Something I found mildly entertaining is the unique way each of the 6 characters ride. No one character rides the same and I don’t have the heart to spoil it. 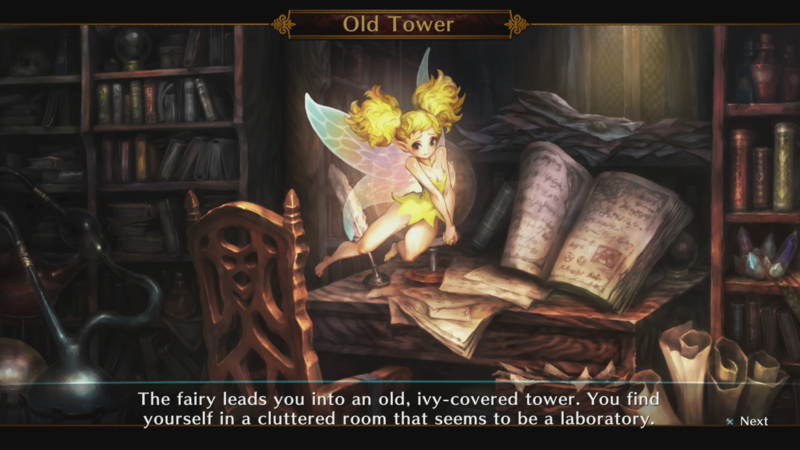 Where does all of Dragon’s Crown’s combat take place, you may ask? Outside the magical town gate that allows easy access to the dangerous ruins – their purpose becoming more clear as your progress in the story. When doing quests for the Adventurers Guild or the various other figures you run across in your travels, you’ll always end up there. Your first foray into the ruins will be a lonesome one – just you and Rannie, but every time after, you’ll be able to bring NPC companions along. You’ll gain these companions by finding their remains, which are in the form of bones, and resurrecting them at the temple within town. Later on, when the online option becomes available, some bones picked up will be of human players. Anytime you see a set of bones that were once fellow human adventurer’s, they’ll be left in the spot where they died. It’s a really intuitive feature that combines Dragon’s Dogma’s Pawn feature with Dark Souls’ option of viewing the spot fellow players died at. But, like I stated, this option is not available at first, but the developer-created NPCs do a good job of keeping the battlefield less lonely. 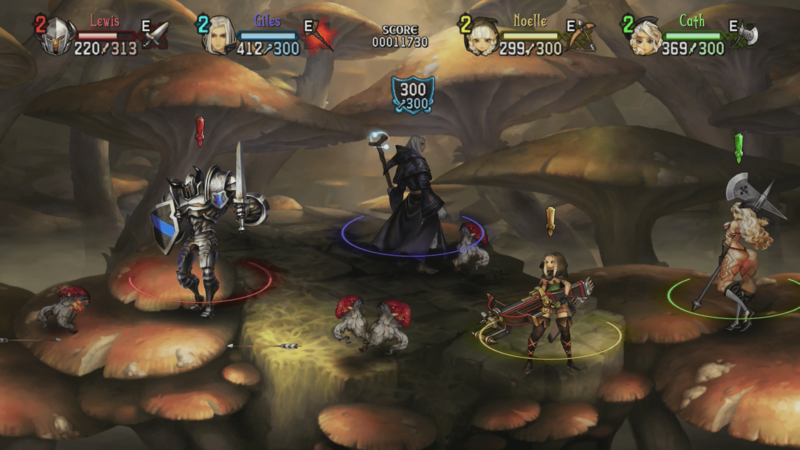 Another nice mechanic added in the game is the ability to replay the stages within Dragon’s Crown as many times as you want. To help with replayability of said stages, an additional path becomes available with the progression of the story. Each additional path has higher leveled enemies and with the temptation of better gear with each visit, grinding to your desired level becomes a joy and less of a chore. This brings me to the gaining of experience and skill points. 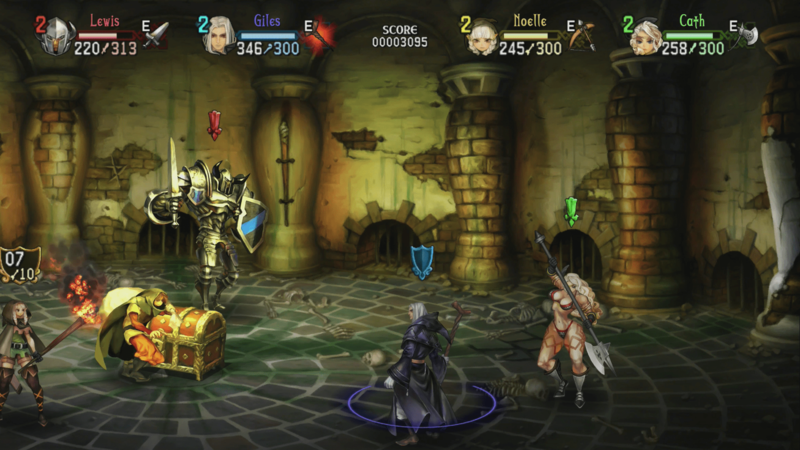 Unlike other RPGs where simply killing foes will grant you experience, Dragon’s Crown takes your overall score – accumulated from collecting loot, opening chests, and the defeat of enemies/bosses – after you’ve completed a session of excavating ruins and gives you 10% (normal difficulty) of it in exp. When Hard Mode unlocks upon completion, you’re rewarded 50% of your total score. Considering that every enemy is scaled so much higher than you, it is a much appreciated change. Now, there are two ways to go about gaining skill points. You can simply level up, or completing side quests for the Adventurers Guild grants you them. Strangely enough, the Guild is also where you spend them on your desired skill. Some skills are class specific and help you tailor your character in a multitude of ways, while others are universal. One of the universal, or common, skills makes each coin you pick up heal you. So not only will your score be going up, so will your health. Lizardmen? Pfft, we’ve had worse. On a non-combatant stand point, players get to control their partner, Rannie the Rogue. You control Rannie by using the right analog stick – bringing up a cursor that can be moved freely around the screen – and pressing L1 when the cursor is on the desired door or treasure chest. Some may find this method of input troublesome, but it never bothered me since there literally isn’t a better input option possible by the controller. So while you’re off eliminating baddies, Rannie can loot the place up for you. Better yet, he can’t die! But when not controlling Rannie, the pointer is used for discovering hidden loot indicated by glowing spots, located in each room. Simply click on them with L1, and out pops loot. Some spots will glow for an extended amount of time, giving you the opportunity to receive an abundance of loot and a huge increase in your score. Rannie the Rogue putting his skills to use.